For nine matches of all tournaments, the series of "Inter" stretched without any victories. The situation is unpleasant, whether it will be possible to correct it in a home match with Crotone? 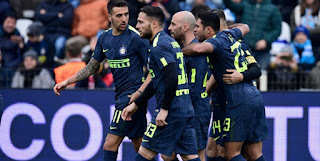 It's hard to believe that Inter, which was already at the top of the Serie A table as early as December, has already released the duo of leaders by more than 10 points and dropped to fourth place. But that's how the team now Luciano Spalletti, giving points to everyone. Of course, we can say that on this segment were drawn "Juventus", "Lazio", "Roma" and "Fiorentina". But Milan lost to "Udinese" (1: 3) and "Sassuolo" (0: 1), and shared points for example with SPAL (1: 1) in the last round. The result - the fourth place, the championship can be safely forgotten, the main task - to stay in the league champion four. The Crotone has a slightly different caliber task - again keeping the propiska in the elite on the agenda of the sharks. After a pause the Calabrians a little cheered up and scored four points in a row, beating "Verona" (3: 0) at home and dividing the points from "Cagliari" (1: 1). But the situation is still difficult - from the "red" zone, only two points of separation.